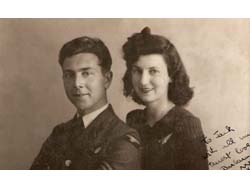 On May 2nd 2007 Beckingham Website received an e mail from a Mr Frederic Vincent from France requesting information about surviving family of an airman, Mr John (Jack) Taylor who was killed in the 2nd World War. 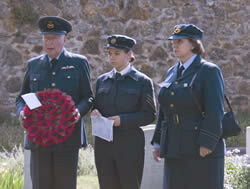 Mr Taylor was killed on 10th June 1944 when his Lancaster Bomber was shot down over the French town of Bois D'Arcy and Mr Vincent said that the town of Bois D'Arcy wanted to remember the crew of RAF 625 Bomber Squadron, plus RAF 166 Bomber Squadron that had been shot down a couple of days earlier. Jack Taylor and his crew were based at Kelstern Airfield, North Lincolnshire and had taken off on the bombing mission of Acheres railway on June 10th. The other Lancaster Bomber that had been shot down 2 days earlier had taken off from Kirmington, Lincolnshire and their bombing raid target had been Versailles, of which Bois D'Arcy is close to. The e mail was distributed to a few Beckingham residents in the hope that someone may have known Jack Taylor or his family. A copy was shown to Robin Fletcher, the Aviation Historian, and he was able to provide Mr Vincent with information regarding the two squadrons and their Airfields. Another copy was shown to the History Group, who through their further investigations discovered that on May 6th Jack Taylor married a Beckingham girl, Barbara Egar at Beckingham Church. From the Marriage Records held at Retford Library it was discovered that Barbara lived at Station Cottage with her parents (her father was a signalman at Beckingham Station) and that they were 22 and 21 years old when they were married. The Egar family were known to some of the older generation and it was mentioned that Barbara's brothers, Alec and Derek, still lived locally in Gainsborough. Through a simple search of the telephone directory, and a short telephone call it was discovered that, although Barbara, sadly, passed away a couple of years ago, she had given birth to a daughter from their very brief marriage (one month!) who was living in Lusby, Lincolnshire. Contact was made and Barbara's daughter, Linda Radford, was put in touch with Frederic Vincent who let her know all the details of the forthcoming celebrations that were to be held in her father's memory. Linda was invited as guest to the town of Bois D'Arcy, along with other surviving families of the Lancaster Bombers, to commemorate the brave crews who died in June 1944. 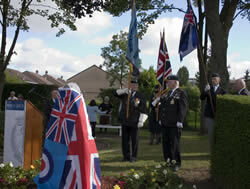 A memorial stone had been placed in the town and the commemorative celebrations were to take place on 20th June 2007. 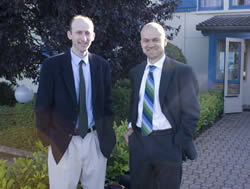 Sadly, Linda was unable to attend, but her two sons, Dudley and Jeremy Radford (grandsons of John Taylor) attended. Frederic Vincent by this time had managed to contact some of the other families involved and everyone finally came together for the first time. 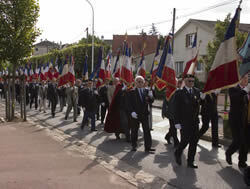 The Mayor of Bois D'Arcy, Monsieur Claude Vuillet whose idea it was in the first place, got together with Veteran's President, Monsieur Jean Charles Vergnaud and war expert Frederic Vincent and between them they brought the whole thing together. 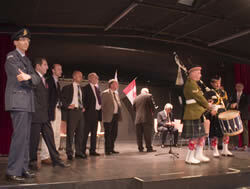 representatives from the embassies of Canada and Australia as some of the crew were Canadian and Australian and a Squadron Leader represented the British Ambassador. including a hand written letter in French and English by the Mayor of Hinckley and Bosworth, Councillor Keith Lynch which was hand delivered to the Mayor of Bois D'Arcy and read out by Greg Drozdz (a representative of one of the airmen's adopted family). Wreaths were laid by the different representatives amid more speeches which was a very emotional event for all that were present. The finale was a Scottish Piper whose bagpipe lament just about summed up the scene. Afterwards a civic reception was held at the Cultural Centre in Bois D'Arcy where French and English mingled, enjoyed the canapés and drinks served by their hosts and looked at the displays that showed photographs of the airmen and their families. 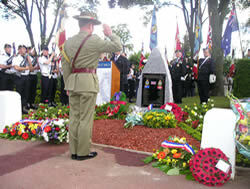 A lunch followed in St Quentin followed by a journey to Clichy Cemetery in Northern Paris where the airmen were buried. 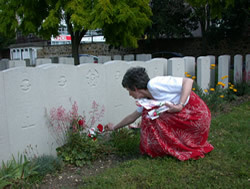 More wreaths and flowers were placed at the graves of the airmen by family members in a private ceremony. A guest of honour at this service was a French lady, Louise Deschamps, who described to the families through a translator, her memories seeing the Lancasters fall to earth. This was a particular moving moment for both Madam Deschamps and the families as she described the events that she had witnessed as an 18 year old girl. The day came to an end with both French and English joined in mutual respect and honouring of the brave airmen that fought and sadly did not survive. A thank you from the French for the role the English played and their bravery, and a thank you from the English for the respect and honouring of their crews after 63 years.